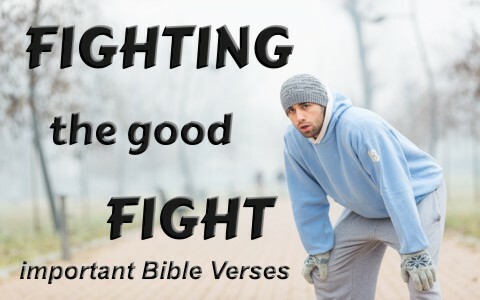 Here are four very important Bible verses about fighting the good fight of faith. The 2nd Book of Timothy and chapter four might be one of the most heartbreaking chapters for me to read. For one thing Paul wrote “I am already being poured out as a drink offering, and the time of my departure has come. I have fought the good fight, I have finished the race, I have kept the faith” (2 Tim 4:6-7) so he knew he was about to die and even though “Demas, in love with this present world, has deserted me and gone to Thessalonica. Luke alone is with me” (2 Tim 4:10-11a). Paul wrote that “At my first defense no one came to stand by me, but all deserted me. May it not be charged against them” (2 Tim 4:16) so in the end, all had forsaken him but only “the Lord stood by me and strengthened me, so that through me the message might be fully proclaimed and all the Gentiles might hear it. So I was rescued from the lion’s mouth. The Lord will rescue me from every evil deed and bring me safely into his heavenly kingdom. To him be the glory forever and ever. Amen.” (2 Tim 4:17-18). This is one of the clearest commands in the Bible that we are to fight the good fight of the faith but what is this fight about? Paul specifies it’s about the Christian faith and the battle ground for the fight is about preserving the faith just like Jude wrote, “contend for the faith that was once for all delivered to the saints” (Jude 1:3). The faith that has already been delivered runs from Genesis to Revelation. There is a battle going on; a battle for the truth so we must strive to preserve what’s already been delivered to the saints. We are not expecting any new deliveries because it was “once for all delivered.” I would say truth is worth fighting for. Jacob wrestled with God but he had been wrestling with a lot of others before this. His name means “supplanter” or “deceiver.” After Jacob had wrestled with God, he realized that “I have seen God face to face, and yet my life has been delivered” (Gen 32:20). Jacob’s name was later changed to Israel as God said “you have striven with God and with men, and have prevailed” (Gen 32:28). Today, we wrestle against an unseen enemy. Satan and his demons are spirit beings but very powerful ones too and because of this, it is necessary to put on “the whole armor of God, that you may be able to stand against the schemes of the devil” (Eph 6:11). How blessed is the man or woman who remains firm in their faith, remaining steadfast even under trial. Just as God told ancient Israel, He says to us “You shall not fear them, for it is the LORD your God who fights for you” (Deut 3:22). The things we fear the most like trials, financial difficulties, and relationship problems are best handled by letting God handle them. Commit it to prayer and then commit it to God because He alone can direct even a pagan king’s heart (Prov 21:1) so don’t be like “those who shrink back and are destroyed, but of those who have faith and preserve their souls” (Heb 10:39). Paul kept his faith in the Lord and kept fighting the good fight of faith till the very end. He wrote that “there is laid up for me the crown of righteousness, which the Lord, the righteous judge, will award to me on that Day, and not only to me but also to all who have loved his appearing” (2 Tim 4:8). Our fight for the faith makes us stronger in the faith. James wrote “For you know that the testing of your faith produces steadfastness” (James 1:3) so the testing of our faith, in fighting for the faith once delivered, produces a steadfastness for the Christian, so keep fighting the good fight of faith my fellow Christian. The very best possible fighting position that a believer could possibly take is on our knees because “The LORD will fight for you, and you have only to be silent” (Ex 14:14); in this way, God receives all the glory. Relating reading: What Does Perseverance of the Saints Mean? Thanks Jim…you are my long-distance Barnabas to be sure. I thank God for you and pray for you brother. Well thank you for this message, may the good Lord Bless you and keep with you always till you enter His heavenly kingdom. Will pray for you sir. Thank you. God bless you for these powerful messages. Thank you. God bless you and continue to use you to bless lives. I was blessed by your message. I “really” needed to read this! I feel so incredibly defeated. Please pray for me. God will not allow us to miss our crown in JESUS NAME. I thank God for this message, God bless you Pastor. The truth is that, we easily forget how God loves us and His great promises. Luke 17:1 “Jesus said to his disciples: “Things that cause people to stumble are bound to come….”. But I have realized that we are not in anyway bound to stumble though those things are bound to come. Fighting the good fight to the end is not easy, and the temptations are sometimes tricky and confusing. e.g The prophet from Judah (1 Kings 13). It was a sad one indeed. I feel strengthened and empowered for reading this. Such encouragment sir. Thank you George. Oh that the churches would be filled with those who build up one another. God bless you for your kind words sir. Pastor the Lord bless you,l am so touched from your words and encourage by every word to live by it. Previous post: How Was Jesus Described In The Old Testament? Next post: Who Was Nimrod In The Bible? Was He Good Or Evil?